Snow cones, hot dogs, frozen drinks, cotton candy and much more! Bring the Carnival Circus to your backyard or event. Over 190 to choose from. Add some interactive sports to your next part! Cool Off with our large selection of water slides and water fun. Have fun on the only Double Mechanical Bull Ride Rental in Dallas. 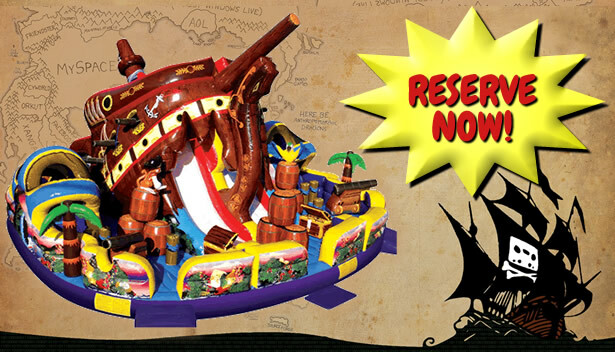 Our new Pirates Cove 3 piece 360° Obstacle Course is packed with obstacles. One enters on the left and the other on the right. Navigate yourself through 17 obstacles, make a turn inwards, climb up the 18' slide and down to the finish line. The first one through the skull's head wins. Can also be rented as a stand alone slide. Bounce ‘N’ More, LLC is a family owned and operated party rental business. We are located in Rockwall, Texas and serve the Dallas Metroplex. We provide fun Inflatable Bounce Houses, Water Slides, and Combo rentals for kids parties, corporate events, churches, fundraisers, city events and more. We also have Concession Equipment and Frozen Drink Machines for rent. We focus on providing safe quality party rental equipment that is clean and sanitized, with on time delivery and the best customer service in the business, all at an affordable, competitive price. 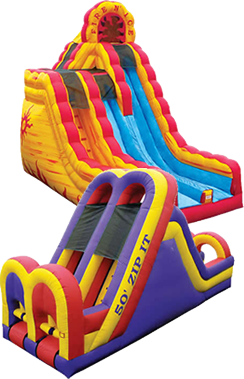 Bounce ‘N’ More is committed to the safe operations of our party rental products. This commitment is demonstrated by our successful completion of the Advanced Inflatable Safety Operations Certification. As a consumer using a bounce house, water slide or other inflatable for any event from backyard birthday parties to school carnivals, company picnics or other events, you deserve the right to find qualified and dedicated operators who are safety conscious with a strong commitment to bringing you a safe enjoyable experience. Bounce 'N' More: Affordable kids bounce party rental Dallas. Bounce house rentals, inflatable water slide rentals Dallas, obstacle course rentals, dunk tank rentals. Dallas concessions equipment, frozen drink machine rentals Dallas, trackless train rental, party train rental Dallas.